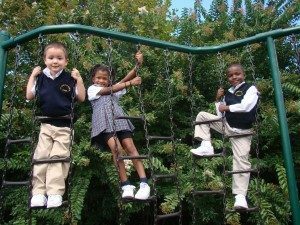 St. John’s Episcopal School offers an Extended Day Program to the families of St. John’s. The Extended Day Program is designed for working parents who need daily care for their children before the school day begins and after the school day ends. The mission of the program is to provide a safe, monitored environment for students. We will provide opportunities for homework, for participation in outdoor/indoor recreation, and time for socializing with friends. We provide trained staff with a one to fifteen teacher-student ratio. The Extended Day Program also provides the structure for the safe care and dismissal of all students on campus after the end of the school day. The program may also be used periodically by other St. John’s parents on a drop-in basis. Drop-ins must be pre-registered with the main office in order to reserve a spot, provided that space is available. Drop-ins are not available every day of the week, and the cost for this service is $15.00 per hour. Extended Day is available from 7:00 a.m. – 8:00 a.m., Monday through Friday, 3:00 p.m. – 6:00 p.m,. Monday through Thursday, and 1:30 p.m. – 5:00 p.m,. on Fridays. There are several days during the school year with noon dismissal, and Extended Day will be made available on those days until 5:00 p.m. There will be no Extended Day on Professional Days, the last day of school prior to Christmas break and the end of the school year, and 2-3 ad hoc days during the school year. All changes in Extended Day will be communicated by the Director of Extended Day and listed in the St. John’s FYI weekly newsletter.